Kangovou Cereal Bowls are chic, highly durable, and 100% non-toxic. The Cereal Bowl is fully insulated and fitted with a lock-tight plastic lid to preserve the freshness of your food. Perfect for the whole family, they are stain resistant, rust resistant, and easily packable into a lunchbox or backpack. You can carry any sort of food with the Cereal Bowl, allowing for healthy eating. The Kangovou Cereal Bowl is a slightly shallow and large bowl that holds more than just cereal. It can hold a variety of foods, from soups to vegetables. The Cereal Bowl is designed to retain heat without transferring the heat to the outside, keeping your hands safe from burns. It also prevents condensation from forming, leaving your furniture dry when you leave it out. The bowl can easily fit into any bag, allowing for it to be taken anywhere and everywhere. You can be sure that Kangovou’s Cereal Bowl is worth the investment if you’re always on-the-go. The Cereal Bowl comes with a 18/8 food grade stainless steel insert, an outer cover made with chemical free plastic, and a clear lid to snap onto and cover the food. 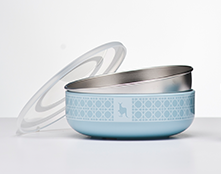 The stainless steel insert allows to food to retain its temperature, whether it be hot or cold. The outer cover and lid both are BPA free, lead free, PVC free, melamine free, and phthalate free, all of them chemicals that can cause harm. This means that no harmful chemicals can seep into your food while you eat, allowing your food to be safe to consume. 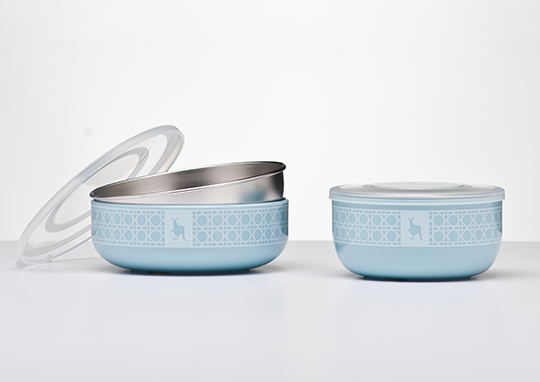 At Kangavou, we believe that a safe and non-toxic container is a container worth eating out of. I love the design and colour. Easy to clean and light weight for stainless steel. I also bought the bowl. Both are a great size which is more than big enough to feed my 2 year old toddler. I like how it’s stainless steel so I can put hot/warm food in it and I don’t have to worry about my toddler breaking it if it gets dropped on the floor. It’s pricey for a bowl but I indulged because I really like the design. The plastic lid can’t stay closed. Keeps popping up so I can’t use it for baby food storage. It is just a feeding bowl in this regard. I bought this one, and also the Innobaby (sp?). The Kangovou one works fine. I wash it mostly by hand, but it’s been through the dishwasher a few times, and still looks like new. The lid closes fine, though I don’t take it with me much and keep it in the fridge to store. All in all, I like it. Wish they’d make a bright pink one! This is a good size for my daughters lunch (toddler). We also use it as a bowl/dish if she brings something in a thermos. The lid stays on and has never spilled or leaked (we don’t put liquid in it but sometimes the pasta will have sauce). It’s very easy to disassemble to wash. It’s held up a few months with regular use and dishwasher cleaning (no warping!). Glad I could find a great item that’s not completely plastic!